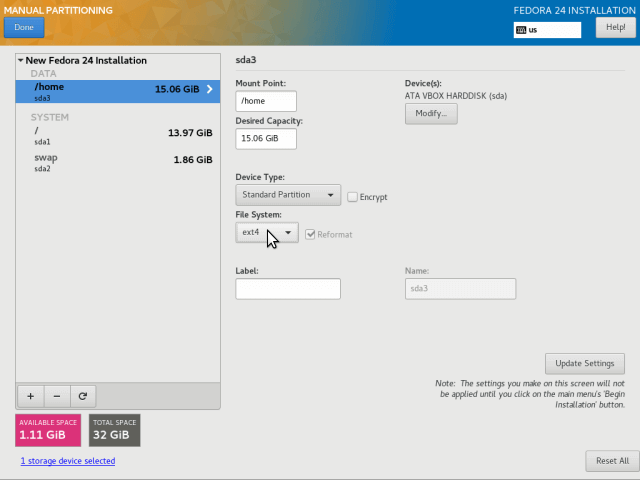 Fedora 24 was released with a server edition, and in this tutorial, we shall go through the various steps of how to install Fedora 24 server with screen shots. 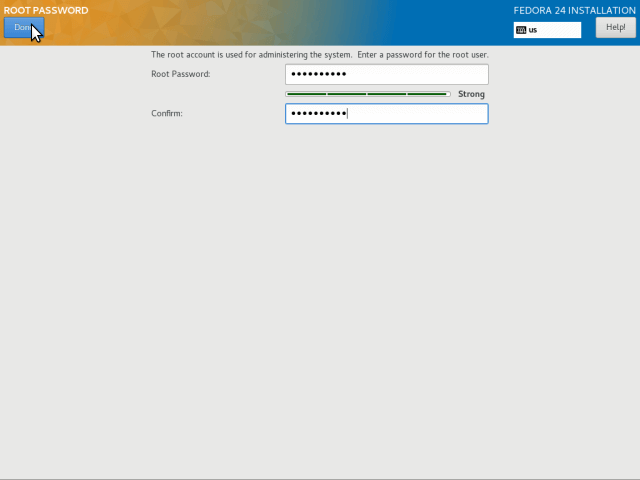 As in Fedora 24 workstation, there are some crucial improvements in the server edition, before we proceed to the installation steps, we shall look at some of the new features and improvements. 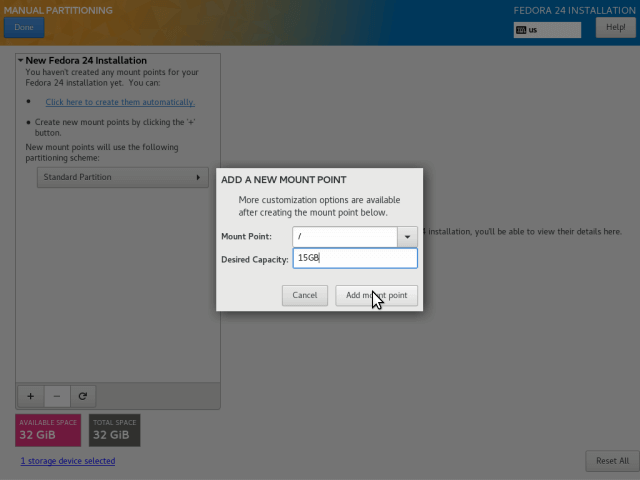 What’s New in Fedora 24 Server? When the image has completed downloading, you have to create a bootable media CD/DVD or USB flashdrive using Unetbootin or dd command. 1. First, choose a working media/port and place your bootable media into it. 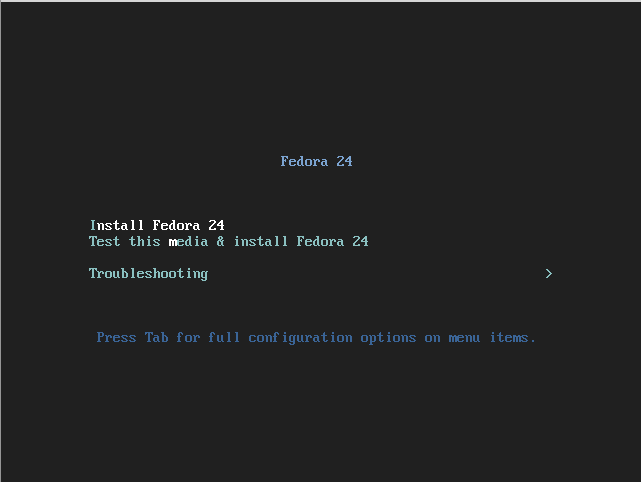 There are two options, one you can install Fedora 24 straight away or test the installation media for any errors before starting installation process. 2. Choose the installation language you wish to use and click on Continue. 3. Next, you will see the screen below which contains the Installation Summary, here, you will configure various system settings including Keyboard layout, Language support, System Time and Date, Installation Source, Software to install, Network and Hostname, Installation Destination (disk). 4. Use the + sign to add a keyboard layout and click Add and after that click Done to move to the Installation Summary interface. 5. 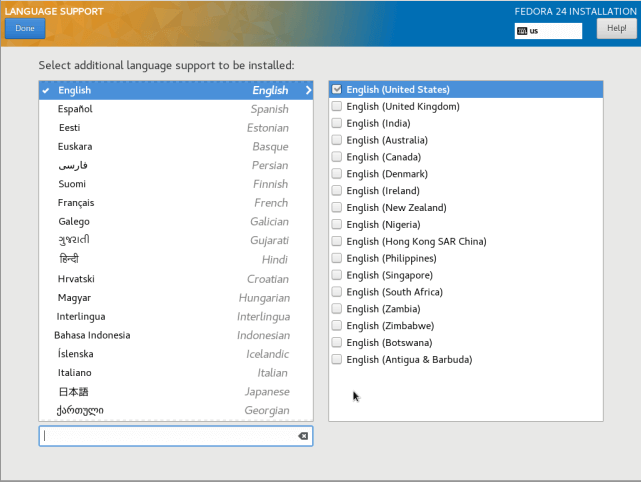 Under this step, you will set your language support, simply search for the language you want to install and click Add to install it. Next click on Done to complete the setting Language support. 6. Managing time is very important on a server, so in this step, you can set the default system timezone, time and date. When your system is connected to the Internet, the time is detected automatically when you switch on Network Time, but you need to set the timezone according to your location. After setting all that, click Done and move to the next step. 7. In this step, you will configure your system partitions and filesystem types for every system partition. There are two ways to setup partitions, one is to use automatic settings and another is to perform a manual setup. In this guide, I have chosen to do everything manually. So, click on the disk image to select it and select “I will configure partitions manually”. Then click Done to go to the next screen in the next step. 8. In the screen below, select “Standard Partition” partitioning scheme from the drop down menu, for creating mounting points for the various partitions you will create on your system. The partition size I have set here is for the purpose of this guide, you can set a capacity of your choice according to the size of your system disk. 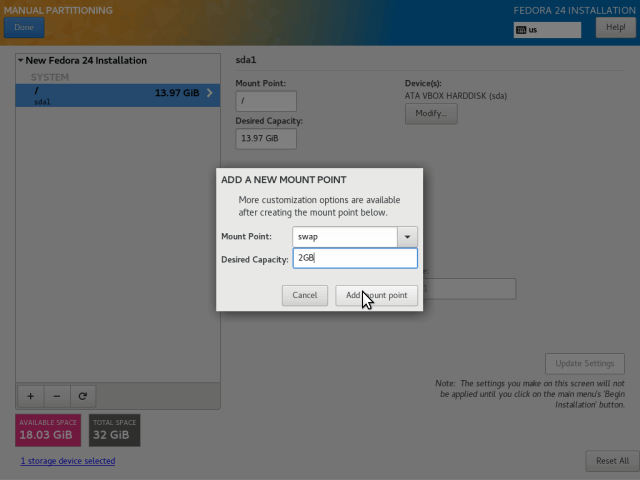 After that click on “Add mount point” to create a mount point for the partition. 10. Every Linux system partition requires a filesystem type, in this step, you need to set a filesystem for the root file system created in the previous step, I have used ext4 because of its features and good performance. 11. Next, create a home partition and mount point which will store system users files and home directories. Then click on “Add mount point” complete setting it and proceed to the next stage. 11. You also need to set a filesystem type for the home partition as you did for the root partition. I have also used ext4. 13. Here, you need to create a swap partition which is space on your hard disk that is allocated to temporarily store extra data in system RAM that is not actively being worked upon by the system in the event that RAM is used up. Then click on “Add mount point” to create the swap space. 14. When you are done creating all the necessary mount points, then click on Done button at the top left corner. You will see the interface below for you to effect all the changes to your disk. 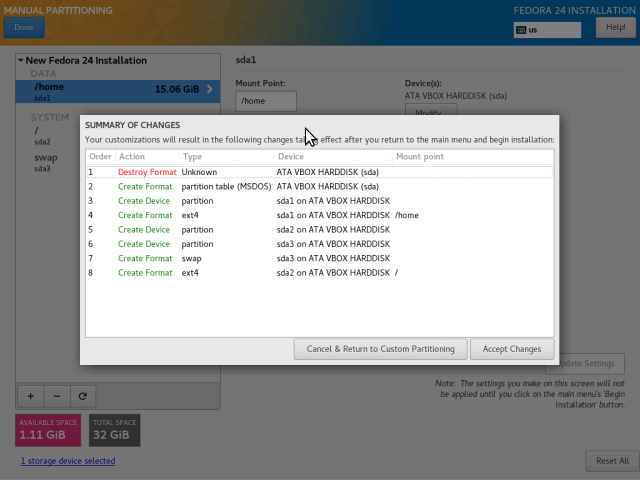 Click on “Accept Changes” to continue, but is you see need for repeating the partitioning steps, then click on “Cancel & Return to Custom Partitioning”. 15. From the previous step, you will move back to the configuration screen, next, click on “Network and Hostname” to set your Hostname. To configure system network settings, click on “Configure…” button and you will be taken to the next screen. 16. Here, you can configure a lot of network settings including server IP address, default gateway, DNS servers plus many more. Since this is a server, you will need to select Manual configuration method from the method drop down menu. Navigate the settings to set other network features and properties as per your serer environment demands. After setting everything, click on save and then click on Done at the left top corner to complete Network & Hostname configurations, you will move back to the Installation Summary screen to begin the actual installation of system files. 17. 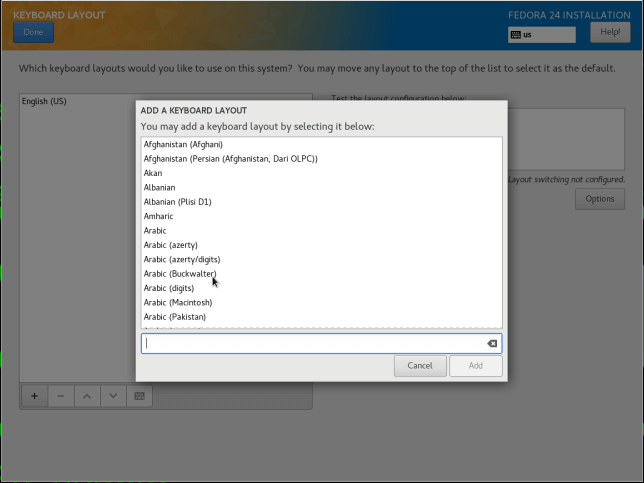 Begin the actual Fedora 24 Server installation of system files by clicking on “Begin Installation” from the screen below. 18. 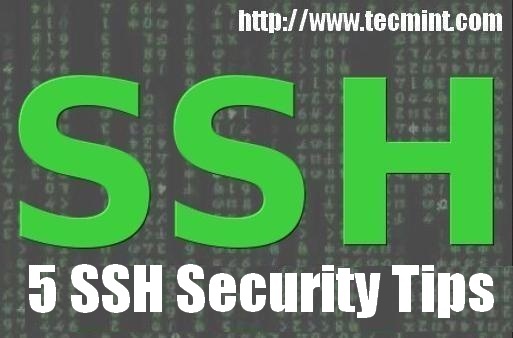 There are two more important things to do, as the installation of system files progresses, you will need to setup your root user password and an additional system user account. Click on “ROOT PASSWORD” to set the root user password, when that is done, click Done and move to the next step. 19. To create an additional user account, simply click on “USER CREATION”, and fill in the necessary information. 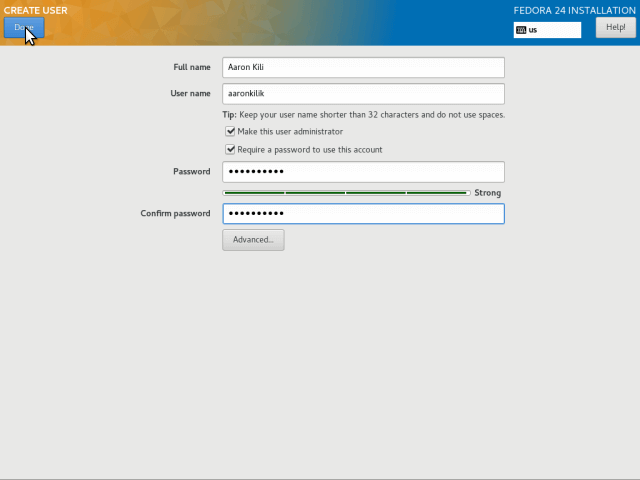 You can optionally give administrator privileges, and also set a password for the user as in the interface below, then click Done after setting all that. 20. Then sit back and relax, wait for the installation to finish, when it is complete, click on Quit in the bottom right corner and reboot your machine. Then remove the installation media and boot into Fedora 24 server. I believe that the above steps were simple and direct to follow as usual, and hope everything went just fine. Now you are ready to start running Fedora 24 on your server machine. You must have installed GNOME/MATE GUI desktop before the commands can work. Try to install a GUI desktop(GNOME/MATE) and then run the commands above, it should work. It seems the GNOME/MATE GUI desktop doesn’t work on Fedora 24 Server via the following cmdline. Is it an expected result?